Speedzilla Motorcycle Message Forums > Special interest > Dirt & Off Road > Recommendations for kid's first dirt bike? Recommendations for kid's first dirt bike? Daughter, will be 8 this March. She is small for her age, about 4' tall and 45 pounds. Can ride a bicycle very well. Looking for a used bike <$750. I am thinking something like a KTM 50, but so many different models over the years it is tough to decide. Definitely a Junior model versus Senior. Maybe a 2002-08 SX50 Junior? The centrifigual clutch would be a plus too. Cheap to rebuild as well. Going a bit older they made air-cooled two-strokes that would be worth considering as well. Or would four-stroke be better? I'm going to be in the same boat as you soon, as my daughter just turned three. I think for your stated price range, a Honda z50/xr50/crf50, whatever you want to call it will be your best bet. From what I've seen, they are the most popular small bike. The popularity also translates into cheaper and easier to find parts. Yep, they have the pink plastic kits. I'd go with the CR50 all day. You can beat the sh!t out of them and hardly maintain them and they'll run. Take care of them and it'll be forever. Plus you could get one and put big boy bars on it and ride right next to her! Bought my son a Suzuki JR-50. Worked well enough but do not buy the training wheels. Ride height is extremely critical. I saw some kids who were newbies on something to tall and got scared quick. Throttle response is critical also. They need something soft and unresponsive to start with. Sold his after a dozen rides. Did not want to ride it. 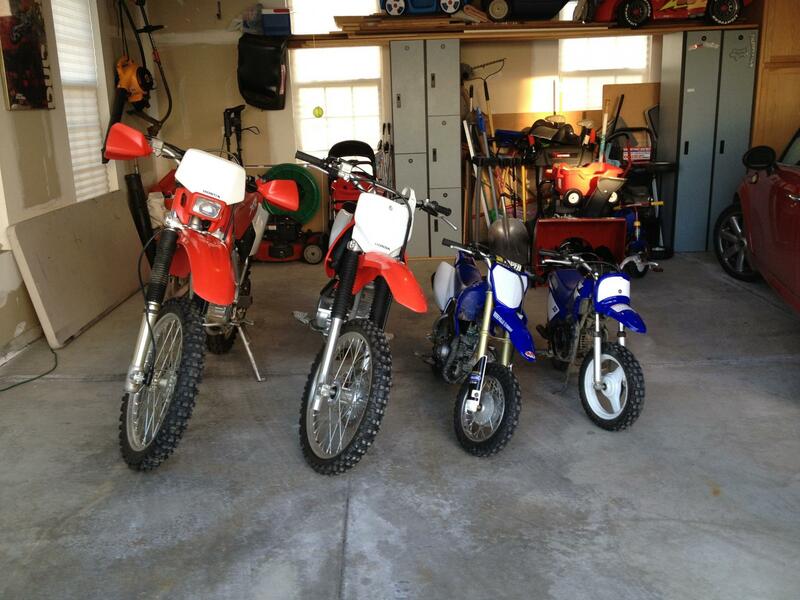 The KTM 50s (and the Cobra 50s that they compete against) are race machines for kids who are going to compete at MX. I would highly recommend that you steer clear of them until your kid actually complains to you that a CRF 50/TT-R 50 is too slow. If you put a kid on a KTM 50 or a Cobra 50 who has never rode before, you are just a jerk. don't waste your money on the air cooled version they really are gutless, if you want to go for a 50 buy a water cooled one and fit the air cooled clutch, it has different springs and take up is much more linear. The water cooled bikes use an auto clutch with cupped washers and can be quite vicious where as the air cooled bike has coil springs. I couldnt disagree more for a first bike. I have yet to meet one kid that is going out on a full on MX bike like a KTM50 or a KX65 jumping on their first time. Get a nice CRF50 and build up confidence. Once youre done with that bike you can resell it for close to what you spent on it and then move up to the real deal MX bikes. The last thing you want to do when teaching someone how to ride is to scare them their first time out. I see what you are saying but disagree the CRF50 is heavy and really doesn't do much for confidence on anything the has ruts and bumps. My youngest was jumping his KTM 50 adventure within 2 months of owning it and found it way too slow and gutless just because a kid starts on a water cooled 50/65 doesn't mean they have to jump it from the start. yea buying a play bike will be good for a little while but you'll soon find yourself needing to upgrade. The KTM, RM, KX aren't that hard to learn on and can grow with the child. I've seen plenty of kids learn on "full on race bikes" as people like to cal them. Further more the 65 can also be fitted with atuo clutches. I had then on 3 of the 65 although if I had to do it again I'd skip fitting one as clutch control isn't that hard to learn. kid are a lot more capable than we give them credit for. My son is turning 3 this summer and his sister is almost 6. I am shopping ttr-50s as they are a little bigger then the PW 50 and they have electric start so hopefully the kid will be able to start it Without help is he/she stalls. I am going to make a track on the in laws property that will be totally appropriate for the little bikes and small kids. I think that is as important as the bike selection. I have been to motor cross tracks where they had a small fry track and I have been to them where the little kids were not big track. You don't want to scare a novice kid and wind up turning them off bikes because then you will wind up spending you're Saturdays taking them to soccer games instead of the track. If you want something zippy, small-medium and pretty tame stock, I'd check into the KLX110/DRZ110. It doesn't have a hand clutch. If that's too big for you, I say CRF50 or XR50. Really can't go wrong with those. I wound up getting a TTR50 with training wheels for my son paid $600. Looks clean, needs a battery but bump starts very easy even cold. Hi guys my daughter is 2 years and i want to purchased he bike for her but i have no idea which bike the best for her..any body recommend me the name of the bike? I wound up also buying a PW50. That is going to be for my 2 year old son and the TTR50 is going to my 6 year old girl. The PW is a lot smaller, which is good for my son. We haven't had them out yet, it has been too wet and we are now getting the gear sorted. Hopefully in a week or 2 we can go on our first family ride.